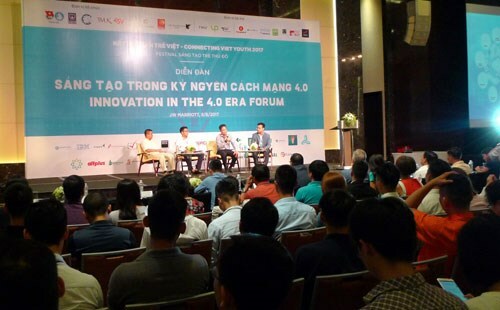 Hanoi (VNA) – The role of the youth in the Fourth Industrial Revolution (Industry 4.0) was highlighted at a forum that attracted 20 domestic and foreign investors and over 1,000 young people in Hanoi on August 9. The “Innovation in the 4.0 Era” forum also drew 30 outstanding startup founders who shared their experience in doing business in the IT sector. Deputy Minister of Science and Technology Tran Van Tung said Industry 4.0 has been developing strongly across the world, and some of its components like Internet of Things, artificial intelligence, big data and smart robots are greatly influencing economic growth in countries around the globe, including Vietnam. To capitalise on the advantages of Industry 4.0, young citizens of Vietnam need to swiftly gain a full understanding of this industry and take appropriate actions to contribute to the national development in the smartest way, he noted. He also affirmed his ministry’s support to and favourable conditions for the development of Industry 4.0 in Vietnam. At the forum, speakers analysed Industry 4.0 and the mutual impacts between this industry and Vietnamese youth. Participants in the event also had a chance to directly experience a number of technologies.